In 2013, we took a trip to our nation's capital. It was winter, and our California bones stiffened against the biting chill of the forty degree weather. But even with the numbing cold, it was this, the Vietnam Veterans Memorial that gave me goose bumps. 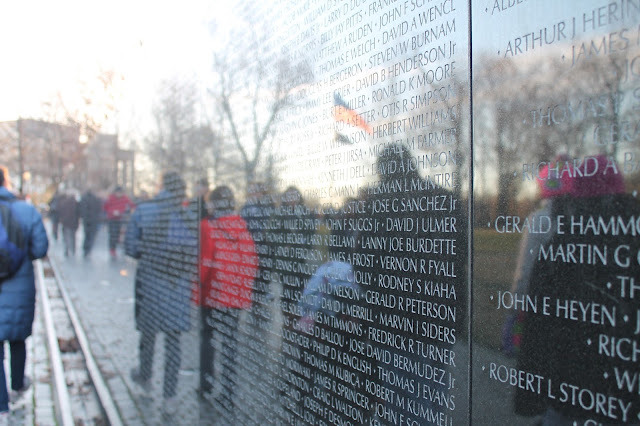 The sheer length of the wall was astonishing, almost frighteningly so, and the number of names carved into it seemed an impossibility. And that was only one wall, for one war. It's hard to imagine the many, many more lives that have been lost to protect our freedom. To the countless men and women of the armed forces who fought so bravely to preserve our freedom, and who took their last breath doing so, I honor you and I thank you. Thank you for your unyielding courage. Thank you for your commitment. Thank you of your sacrifice. Awesome! I love this heartfelt post ! Thank you, again, to our heroes in the armed forces!